Canon has finally put an end to various leaks and rumours of a replacement for its EOS 6D model by confirming that a Mark II update will soon hit the shelves. The EOS 6D Mark II is set to be the first Canon EOS DSLR to sport a newly developed 26.2MP full-frame CMOS sensor, which replaces the 20.2MP sensor in the original EOS 6D. Canon claims to have designed this to produce a wide dynamic range, in order to provide “exceptional” exposure latitude. It can be adjusted up to ISO40,000 as standard, and up to settings equivalent to ISO102,400 when using the expansion settings. The EOS 6D Mark II also has the honour of being the first full-frame body in Canon’s EOS DSLR stable to incorporate a vari-angle touchscreen display, which echoes the designs of its recent APS-C-based cameras such as the EOS Rebel T7i / EOS 800D and EOS 77D. Here, the screen measures three inches in size and boasts a capacitive touch-sensitive surface. A further LCD is located on the camera’s top plate. The camera also employs the latest DIGIC 7 processing engine, which has slowly started to appear elsewhere in Canon’s various camera line-ups. This enables burst shooting at up to 6.5fps, which makes it potentially more useful for action than its 4.5fps-shooting predecessor. Some may be disheartened to learn that the engine doesn't support 4K video recording, although the camera does offer both an intervalometer and a 4K timelapse option. Full HD video recording is supported up to 60fps, and you can also call upon digital five-axis image stabilization to help steady footage. This can work in concert with lens-based IS when a lens that includes the system is mounted on the body. In addition to having a similar 45-point, all-cross-type AF system as the EOS 80D, the 6D Mark II also makes use of Canon’s Dual Pixel CMOS AF system. This provides professional-level continuous focus and subject tracking when recording videos or using live view. Metering is handled by the familiar 7560-pixel RGB+IR sensor, with evaluative, centre-weighted, partial and spot options to choose from, as well as -/+5EV exposure compensation. Canon’s Flicker Detection feature, which aims to achieve better consistency under artificial lighting, has also made the cut. The camera’s pentaprism viewfinder provides coverage for around 98% of the frame, with Canon’s Intelligent Viewfinder II system on board to overlay useful information as you shoot. 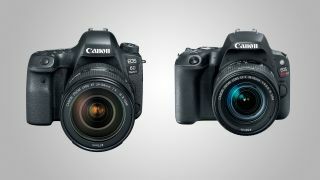 The model also inherits the Wi-Fi and GPS technologies incorporated in the original EOS 6D, and these are now augmented with NFC and low-energy Bluetooth. Battery life, meanwhile, is quoted at up to 1,200 shots – almost double the 670 frames of the EOS 6D. The model makes use of aluminum alloy and polycarbonate resin paneling with glass fibre, while dust and weather resistance is provided through various seals. Everything is recorded to the user’s choice of SD, SDHC and SDXC media, with support up to the UHS-I standard. In the UK the EOS 6D Mark II is set to be available for £1,999.99 as a body-only option, although it will also be available with the Canon EF 24-105mm f/3.5-5.6 IS STM for £2,379.99 – US and Australian pricing is still to be confirmed. There's also a new battery grip that’s compatible with the camera, the BG-E21, priced at £199.99. Canon has also refreshed its most junior DSLR proposition with announcement of the EOS Rebel SL2 (known as the EOS 200D outside the US). Designed with the smartphone generation in mind, the EOS Rebel SL2 / EOS 200D updates the EOS Rebel SL1 / EOS 100D that was announced back in 2013. It arrives with a significantly overhauled feature set, which includes a core of a 24.2MP APS-C-type sensor and a DIGIC 7 processor, Canon’s latest imaging engine. In addition to stills, this partnership combines to record Full HD video at up to 60fps, while the camera has a built-in intervalometer, which can be used to capture timelapse footage. In addition to handling image processing, the DIGIC 7 processor also enables the Rebel SL2 / EOS 200D to shoot at up to 5fps – a 1fps improvement over the EOS Rebel SL1/ EOS 100D. The new camera also has the Guided UI feature that has appeared on other recent Canon models. This is designed to help first-time users better understand their camera’s functionality through a more friendly interface that makes better use of graphics. Images can be captured across a range of sensitivities between ISO100-25,600 inclusive, with ISO changed incrementally in 1/3EV stops and noise-reduction options provided alongside. This range reduces to 100-12,800 when recording video. As with many other recent Canon models, the 24.2MP sensor has been designed with phase-detect AF pixels to provide Canon’s Dual Pixel CMOS AF system. This ensures the model has the same smooth focus during video recording and live view as other models that sport the technology, and also makes face detection and subject tracking possible when using either. When using the camera’s pentamirror viewfinder, the user has the option to focus using a 9-point AF system that’s arranged in the familiar diamond formation, although manual focus is also on hand. Users can also focus by tapping the touch-sensitive, 3.0-inch Clear View II display with their finger. This display, which has a resolution of 1.04 million dots, can also be adjusted to a range of angles through its vari-angle design, in order to facilitate high- and low-angle shooting. Furthermore, its design also allows the user to fold it to face the camera when not in use, in order to protect its surface. Thanks to a largely polycarbonate body, the EOS Rebel SL2 / EOS 200D weighs just 390g with its battery and memory card in place. The model has been designed with both an integrated flashgun and a hot shoe to mount external flashes, while Wi-Fi and Bluetooth technology are on board. The EOS Rebel SL2 / EOS 200D will arrive next month in a choice of three colors, namely black, white and a 'vintage-inspired' silver/tan finish. Body-only options will retail at £579.99 in the UK, while a kit option with the EF-S 18-55mm f/4-5.6 IS STM lens will be priced at £679.99. Again, US and Australian pricing is still to be confirmed.